Haldex Concentric has completed a major reorganization and investment in its manufacturing plant in Birmingham, UK, including the creation of a new clean area for assembly, separate from the rest of the factory, where the components for its diesel engine pumps are manufactured. The re-organization, which was part of a multi-million pound investment programme, was initially designed to run into 2010 but has completed well ahead of schedule due to the enthusiasm and commitment of the project team led by Head of Production, John Beadsworth. 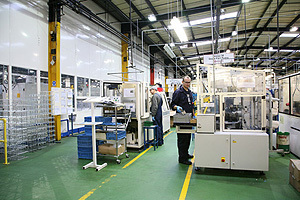 David Woolley, Managing Director of the Birmingham and Indian factories of the Haldex Hydraulic Systems Division, commented: "There was already a dedicated clean room in the factory assembling pumps for the US engine manufacturer Cummins and when customers heard what we were doing, they were very supportive and this helped us to work around the schedules. We were able to complete much of the work during normal shutdowns, through preparing the ground in advance, working at weekends and gradually moving cells around into available space. In addition, we took the opportunity to improve overall timing by involving team leaders and technical support staff as part of their project work leading to the NVQ in business improvement techniques." The most obvious change has been building a wall across the factory to provide a physical barrier between machining operations and assembly, but the project has included a host of other features such as re-levelling the floor, new skylights and heating equipment and a revised layout. Older machines have been phased out and new machinery installed. Over £6 million has been invested in thirteen Enshu and Mori Seki horizontal machining centres, one Kira vertical machining centre and one Takamaz automated CNC lathe, as well as specialized washing, assembly and test equipment. Apart from ensuring a high standard of cleanliness for the assembly process, the project has enabled a thorough revision of the layout and freeing up additional space for new business and increases in volume, which have been very substantial in recent years. Customers benefiting from the new facilities include Caterpillar, Deutz, Ford, Mercedes, NACCO, Perkins and ZF. Concentric was acquired by Haldex AB in February 2008 and is now known as the Engine Business Unit of the group's Hydraulics Division. The unit is a major supplier to the worlds truck, agricultural and construction equipment industries, with manufacturing facilities in Germany, Sweden, the USA, China and India as well as at the divisional headquarters in Birmingham, UK. In addition to oil, fuel and water pumps for diesel engines, Haldex Concentric manufactures the Alfdex air/oil separator, Varivent EGR accelerator, integrated front cover assemblies and lubrication pumps for transmissions and reciprocating compressors.